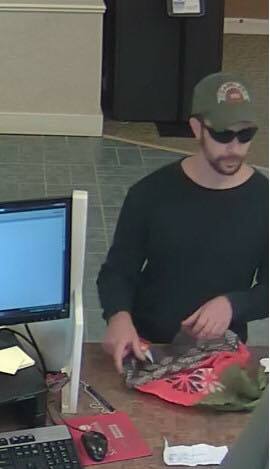 White Male in his late 20’s to early 30’s, approximately 5’6” to 5”10” tall and 140-160 lbs. with a short beard and mustache. 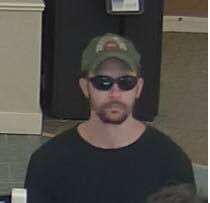 He was last seen wearing a green baseball cap with unknown lettering on the front, sunglasses, a green long-sleeved pullover shirt, light blue jeans and white sneakers. The suspect stole an undisclosed amount of money, which was carried in a unique pink and gray reusable type grocery bag with a floral design on the bottom of it. No weapon was shown and no one was injured. ​The Charlestown Police were assisted on scene by the Walpole Police Department, New Hampshire State Police and Sullivan County Sheriff’s Office. The investigation is ongoing. Anyone with any information is urged to contact Chief Patrick Connors by phone at (603) 826-5747 or by email at pconnors@charlestown-nh.gov.